An updated English report from the SustainTrans team shows how Sweden might show global leadership in the decarbonization of the personal transport sector. The IPCC Special report on the impacts of global warming of 1.5°C released in October 2018 reiterates the urgency of the need to decarbonize all aspects of global society. The research conducted between 2011-2017 was inspired by the Swedish Governments early and ambitious commitment rapidly decarbonize the transport sector. Various scenarios were modelled to demonstrate possible ways to achieve fossil free passenger transport by 2030. The research is translated into a roadmap outlining the necessary steps required to achieve this monumental task. 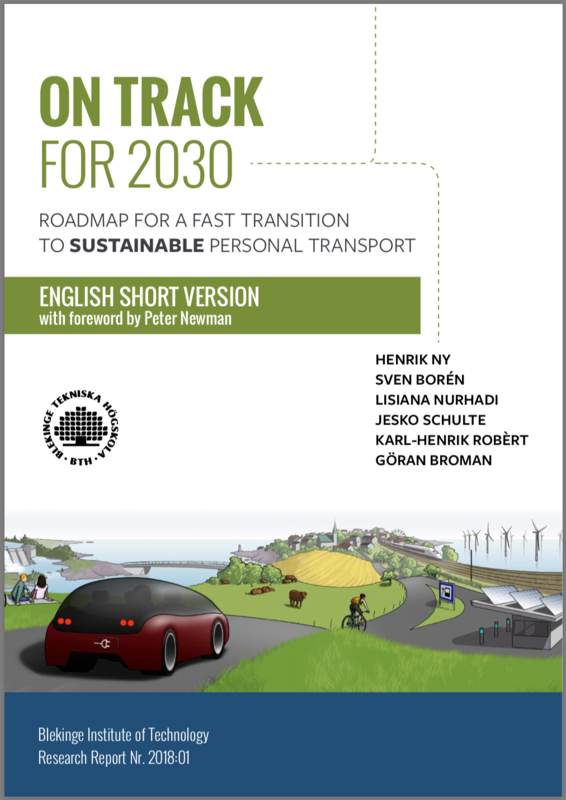 The original roadmap report was published in Swedish in 2017. This new new updated English short report version is timely as it showcases how Sweden could demonstrate global leadership in this area to become a bright light in these challenging times. The global spread of SustainTrans research is also facilitated by a new cooperation with the Australian professor Peter Newman. He wrote the foreword of the English report and he is also the IPCC lead author on transport.